Sir John Soane’s Museum sticks out, literally sticks out a good foot from the rest of buildings surrounding it on Lincolns Inn Fields. The man who designed the Bank of England was determined that his own house would be distinctive. When he died he bequeathed his house and contents to the nation on the condition that they were left largely has he had left them. Before you can gain entry you are required to turn your phone off and place your handbag in a plastic bag to prevent it from damaging the contents of the house. Once inside the first room you encounter is a looks like a knock through lounge diner, it deploys clever use of mirrors but feels much like any other period house. Turn right, however, and you enter a different world. 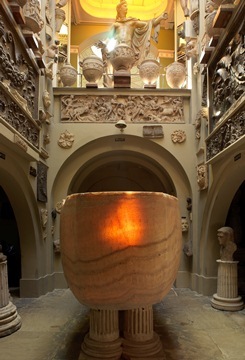 A corridor overlooking a light well is deployed as a study, cleverly fitted with desk and drawers and the walls are hung with chunks of marble from ancient Greek and Roman buildings. 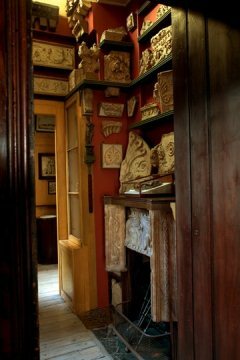 John Soane must have been a slender man as the opening to the next room is barely wide enough walk through. Squeezing through the narrow space takes you to yet another world. Below you can glimpse a crypt, to your left in the distance the most enormous statue of Hercules. But first turn left, you will find yourself confronted by what is considered to be one of the very finest Venetian paintings executed by Canelletto. The room you are standing in is small, no more than three strides square, but two more Canalettos jostle for space on the crowded walls. It is important at this stage to befriend the room guide and ask them to open the panels, as walls open up to reveal yet more paintings – Hogarth’s ‘The Rakes Progress’ and ‘An Election’ in their entirety. Once you have had your fill of those the northern wall opens again to reveal a Monks Cell below and a statue at eye level. The Crypt and Monument Court lay beyond the Picture Gallery. John Soane as well as being slender appears to have been something of an architectural magpie. An enormous marble sarcophagus, too large even for an Oligarchs bath, occupies centre stage, but you will also find cork models of Pompeii, the Coliseum at Rome, the Parthenon in Athens to name but three, yet more chunks of masonry. This was his own personal museum and also a place for his students to study the Classics of architecture. Once out of the Crypt and Monument Court the house returns to almost normal, until you are half way up the stairs and notice a small recess. On closer inspection this contains a bust of Shakespeare, stained glass and paintings. Just a small space used to pay homage to the playwright. At the top of the stairs is the South Drawing Room, back to standard stately home territory here but painted in newly restored Turner yellow. My companion thought the yellow a bit too yellow. I loved it but then I did once get married in a bright yellow dress. As you walk out of the house you are confronted by the leafy greenery of Lincolns Inn Fields, in the middle lurks what looks like a large shed but is in fact a café that offers a fine pizza in addition to the usual coffee. Every purchase made at the Fields Bar and Kitchen prompts a donation to the museum. 12-15 Lincolns Inn Fields, nearest tube Holborn. Free of charge, open Tuesday-Saturday 10-5. Also open on the first Tuesday evening of every month when the house is lit by candlelight, arrive early and be prepared to queue. Doors open at 6pm but tickets are issued from 5.30pm.